A meeting of East and West, Turkey's ancient ruins are some of the most impressive in the Mediterranean, offset just as spectacularly by densely forested mountains, peaceful rivers and the bluest of seas. Explore inland and you’ll discover the countryside of a bygone era, where women in headscarves tend goats, men play backgammon in the shade of trees and everyone listens for the Muezzins's call to prayer. Family comes first here and the locals welcome visitors as one of their own, with children warmly included everywhere. From cosmopolitan Kalkan to Dalyan, Akyaka and sleepy Bozburun, our well-appointed hotels, and villas include Turkey’s most beautiful holiday destinations. Please note that British nationals require a visa when travelling to Turkey. From 29 October 2018 the visa on arrival service will no longer be available, and an e-Visa must be secured in advance of travel from the Turkish Electronic Visa Application System. For more information on entry requirements for Turkey, visit the Foreign and Commonwealth Office Travel Advice or read our FAQs. "With its idyllic setting, amazing pool and beautiful gardens, this well-equipped and tastefully decorated villa was a real home from home." "The photographs of the… Simpson Secret – Akyaka, are true, and there are no surprises when you arrive... Also, thank you for providing one bedroom villas – as a couple we are fed up with having to pay for a larger villa when there are only two of us." "Waterfront Cottage is an absolute delight. Whilst just a one-bedroom property, the interior feels spacious… However… the outside space makes this the perfect place; the pool area, gardens and terraces are beautiful...The location could not be bettered." "Thank you for another memorable holiday. Zeytin Evi – we’ve tried the rest, but we’ve settled on the best! We will definitely be back." We’ve gone beyond the tourist epicentres to open up a beautiful side of authentic Turkey that stands apart from the crowd. Choose a luxury holiday here and discover the sea, mountain and riverscapes that provide a captivating backdrop to our handpicked accommodation. Admire the Turquoise Coast from a traditional gület boat; discover the wildflowers along a walking trail or enjoy a taste of tradition as you sip a black çay in the local tea gardens, but above all, allow your senses to be transported as only a luxury holiday in Turkey can do. At the heart of Gökova Bay sits this charming coastal town. A favourite destination of discerning Turks, it offers a slower paced kind of holiday in a timeless atmosphere. Part of the Cittaslow movement, it’s known for its whitewashed houses, typical, with their ornate pine-timbered eaves and balconies, of the local Ula-Muğla architecture. 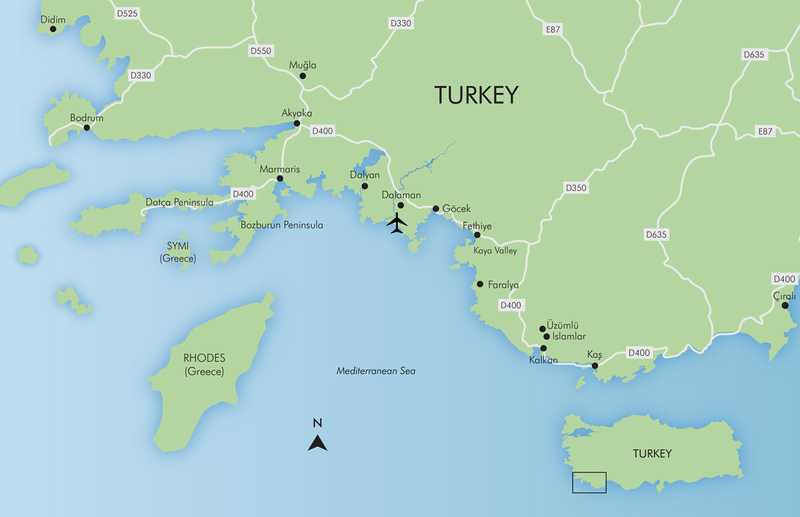 Where the Mediterranean meets the Aegean lies the Bozburun Peninsula. Enjoy leisurely country walks, passing through fig and olive groves or drift into one of the local restaurants with their captivating views. A stay here is perfect for those who seek natural beauty yet enjoy a touch of discrete luxury. The Dalyan River, offering the same natural restorative treatments once enjoyed by the Romans, creates the perfect setting for an unforgettable holiday. River taxis weave their way down the delta, rich in wildlife and a protected breeding ground for the loggerhead turtle, with ancient rock tombs and beautiful Iztuzu Beach not far away. Nestled high in the foothills of the Taurus Mountains with impressive views towards Kalkan Bay, the timeless village of Islamlar offers the rural tranquillity of years gone by. Visitors can experience a way of life unchanged for centuries, where shepherds still herd their sheep and goats through the olive groves. This picturesque harbour town is a cosmopolitan gem on the stunning Turquoise Coast. Rooftop restaurants and laid-back waterfront bars create the holiday ambience, without losing any of the Turkish character of traditional tea houses and weekly markets. For a perfect day’s excursion, visit the impressive ruins and rolling dunes of Patara. Bohemian Kaş has attracted travellers since the 1920s. A quintessentially romantic destination, visitors can explore the beauty of the dramatic coastline, with its watersports and diving; go climbing in the nearby mountains or explore the winding streets of this traditional market town, home to painters and performers, as well as fishermen.